Installing woodland gardens may be the low-maintenance landscaping solution that you've been seeking if part of your yard is dominated by large trees. Have you ever wondered what planting options you have for adjacent areas, plagued as they probably are by shade, falling leaves, and drought? Or perhaps it's your neighbor who owns the trees, creating a challenge for planting near your property border? There are a couple of different looks I have in mind when I say, "woodland gardens." In either type of woodland garden, I'm referring to areas in shade most of the day. If the areas in question are located north of the problematic trees, then it's safe to say they're shaded. Such areas cry out to be planted with shade plants. Don't try to force full-sun plants (including grass) to grow there: you'll be disappointed. Let's look now at the problem of falling leaves in fall. Leaf-removal from lawns is one thing; leaf-removal from planting beds is quite another. Even if you'll be using leaf blowers, it's tedious work to try to remove every last leaf from the latter, in your attempts at a picture-perfect landscape. That's where woodland gardens come in to play. If the areas in question are located out of the way somewhere, in the backyard, perhaps it's time to stop being so fussy about leaf-removal. After all, haven't you better things to do on a gorgeous fall day? Beside shade and falling leaves, the third challenge in areas shaded by trees is, in some cases, lack of water. Why? Trees have enormous root systems for taking up water, so they pose stiff competition for any other plant in the area seeking a decent drink. Unless you irrigate woodland gardens or avoid locating them too close to trees, stick to dry-shade plants in your plant selection. Many people use lily-of-the-valley, but it's quite invasive, unhappily. Many native plants fall into this group, too, however, so take advantage of them. In examples of classic woodland gardens, the look achieved is that you'd find bordering forests in your area. The leaves from the nearby trees form the "mulch," so you just leave the leaves in place, thereby eliminating leaf-removal. For plants, select specimens native to your region. In my region (New England, USA), that would mean plants such as ferns, arrowwood viburnum shrubs, mountain laurel shrubs, bloodroot wildflowers, bunchberry, and partridgeberry vines. If you do a Web search for "native plants" plus the name of your state, you may be able to find a local supplier of plants native to your area. Not yet ready to commit to native plants? If you're still in the exploratory stages in this matter, begin by getting out and exploring the woods in your region, to familiarize yourself with its native plants. Take a good wildflower identification book along with you. The drawback with classic woodland gardens is that the wind will blow the leaves all over your yard. This tends to restrict classic woodland gardens to rural areas. Not to worry. Next, we look at a version more suitable to suburban landscaping. Not taking "woodland gardens" quite so literally, one can also strive simply for a low-maintenance yard with an informal look. Think "diversification," so that you get something of interest in each of the four seasons of landscaping. 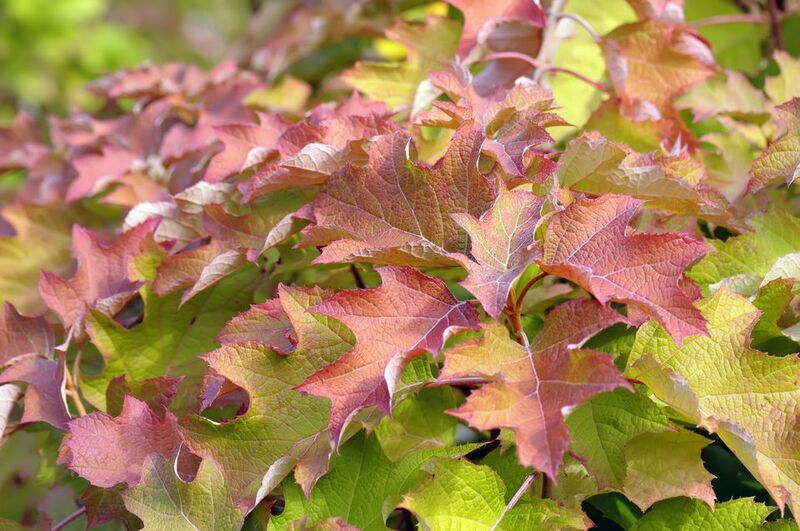 Install flowering shrubs such as rhododendrons for spring blossoms, evergreens such as yews for winter color, and blackhaw viburnum shrubs for fall color (of course, you place yourself ahead in the game if you grow something with multi-season interest, such as oakleaf hydrangea). Spring bulb plants will naturalize, and they bloom early enough to take advantage of the sun the area will get before the trees leaf out. Hosta plants bloom in summer and can be used as a border. But what about the leaves that fall into this "suburban" woodland garden? Should you leave them in place? It's a better idea to gather up the bulk of the leaves and shred them first, before (re-)applying them as mulch (you don't have to be fussy, though: no need to deal with every last leaf). Since shredded leaves make for a neater, more "acceptable" look, this may be the best option for those skeptical of the look of classic woodland gardens: the latter may be a bit too rustic for some homeowners. But it's not just an aesthetic issue. Specimens that are not native to the forests of your area can have trouble coping with an overabundance of unshredded leaves. Unshredded leaves mat down and may block water from reaching plant roots. Leaves left on top of herbaceous perennials over winter do provide insulation, but they can also smother plants in spring. Even if you shred the leaves first, you should still scoop them away from plants in spring, to avoid possible smothering. Remove the leaves gradually (an inch or so per week), so that the plants can adjust gradually to being exposed. You can buy leaf-shredders to facilitate the task of leaf-shredding. But for shredding leaves cheaply, many people install the bag attachment on a lawn mower, then run the mower over the leaves. The bag of shredded leaves can then be moved to the area requiring mulch, to be emptied. Again, no need to get every last leaf, just the bulk of them. Install your hosta border so as to encompass most of your planting, "fencing" it off. And plant the hostas close together. That way, the hostas will trap many of the leaves, when the wind attempts to blow them all over the rest of your yard. As you can see, while such plantings are low-maintenance, they do involve some maintenance—but still a far cry from the maintenance involved in having to remove every last leaf, in an attempt at a picture-perfect landscape. More importantly, woodland gardens offer a solution to the challenges posed by shaded areas. These low-maintenance plantings will free you up to enjoy a crisp autumn day as you should, touring the countryside and marveling at its magnificent fall foliage trees. Enjoying leaves, rather than raking them: that's my idea of a perfect fall day.